If a modern day version of Romeo and Juliet was created with a Fast & Furious tilt, Mercutio better watch out because Tybalt is going to whoop him in some kind of drag/drift/stabbing event with this Capulet kit car. In the tragedy Romeo and Juliet, ostensibly written by William Shakespeare (who are we kidding, we all know that Shakespeare didn't write all those plays, it was Christopher Marlow, Earl of Oxford) there are two feuding Italian families, the Montagues and the Capulets. People get stabbed, fake their deaths, actually die...this should be familiar with anyone who was awake and sober in the 9th and 10th grade English class. What won't be familiar is the use of the Capulet name on the side of a Lotus Seven based kit car. 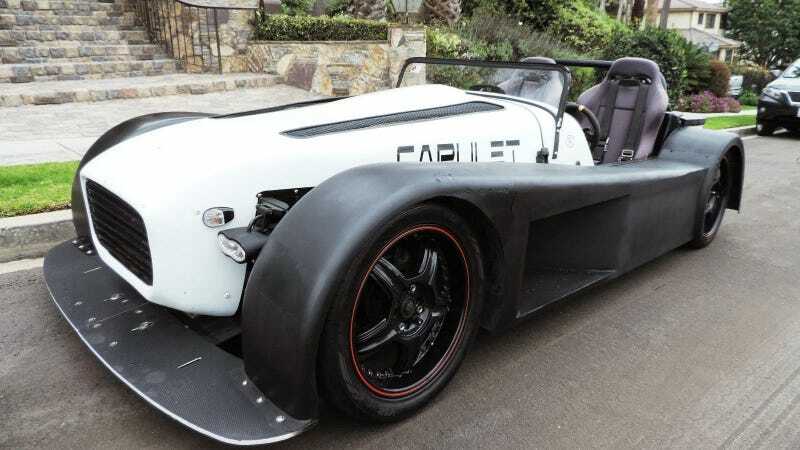 Find this 2011 Capulet Lotus Seven Kit currently bidding for $7,700 in Hermosa Beach, CA with less than 1 day to go. Using the magic 8-ball that is google comes up with no major/minor kit manufacturer called Capulet. What you do find are a few instagram (I'm not sure, but I believe this is a service that instantly calculates the weight of any white powdery substance in grams based on a photo..works great when you are baking cookies and have lost your teaspoon) photos that show this car and reference something that is part road rally part airsoft shoot-em-up event. Gentle Mercutio, put thy rapier up...BLAM-BLAM. The red-bull decals have been removed, but this is certainly the same car. Under the hood is a 302 cubic inch Ford V8, complete with number of performance parts and one of the strangest spark plug routing setups any of us have seen. Is that plastic electrical wiring loom wrapped around the plug wires? The Ford engine is a tight squeeze in a chassis designed for small inline-4 cylinder engines and the exhaust headers route forward and merge together before going somewhere down...hopefully to the back of the car. Additional interweb searching locates this youtube video taken in November of 2013 showing a fairly detailed walk around of the car. More interesting is that CaseyCars (the dealer in Hermosa Beach that is currently auctioning the car on ebay) posted a note on the youtube video asking the uploader to contact them to find more info about the car. They must have picked it up at an auction and are trying to figure out exactly what they have. Originally posted as 5k: Montagues Beware: 2011 Capulet Lotus Seven Kit... on Daily Turismo.